FIA's WRC expands LiveU video production. Hackensack, NJ, March 2019: Following on from a very successful test of LiveU’s technology at the ADAC Rallye Deutschland in Germany last August, WRC Promoter GmbH, the company that’s responsible for all commercial aspects of the FIA World Rally Championship, has signed up to use LiveU’s technology across 10 rallies this year. 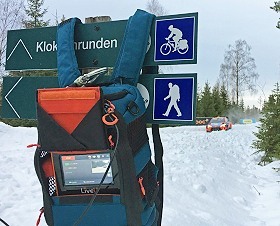 LiveU has already helped bring enhanced coverage of Rallye Monte-Carlo and Rally Sweden to viewers in 2019, with another eight events also set to benefit. They include: Tour de Corse, Rally de Portugal, Rally Italia Sardegna, Rally Finland, ADAC Rallye Deutschland, Rally Turkey, Wales Rally GB and Rally RACC Catalunya – Rally de España. Florian Ruth, Director of Content and Production, WRC Promoter, said, “We are using three LU600 HEVC-equipped units with associated LiveU server technology and LiveU Central for overall management. HEVC is very important for us to significantly reduce bandwidth and LiveU has fitted smoothly into our production workflows." Following on from the initial test last year, WRC Promotor has worked closely with LiveU to fully understand how to maximize the quality and the coverage. Ruth highlights the fact that at each event so far, they have continued this optimisation process, with the next rally – Tour de Corse – set to be the first time that the LU600s have been involved in testing camera positions in advance of the event. 2018 saw The FIA World Rally Championship (WRC) reach its best ever global airtime figure of 14,208 hours over last season’s 13 rounds, according to Nielsen Research. The WRC, recognised by the Fédération Internationale de l'Automobile (FIA), has a long and celebrated history, with 14 rallies around the world forming the 2019 series. WRC Promoter handles all the TV production, including all the broadcast formats, as well as the marketing of the series and sponsorship rights. It also works to increase the number of participants and explores new venues for the calendar.